There are only a handful of Physician's, Surgeons and Dentists in the Bay Area who are known for outstanding patient outcomes and nearly perfect records of healing. The secret weapon they all have in common? Hyperbaric Oxygen Therapy (HBOT). Medical professionals in hospitals, medical centers and in private practice refer patients for HBOT in every major city in the USA, including San Francisco, Hollywood, Austin, Seattle, New York City, Malibu and beyond. Why do so many physicians refer, and why should YOU? The Science proves it works: Choose your specialty from the list to the right to see specifically how it can benefit your patients. The patients get results: When you refer patients to treatments that work, they remain loyal to your practice. The process is simple and safe: Many pharmaceuticals have extensive lists of undesirable side effects and contraindications. HBOT has never been blacklisted and is approved for a vast majority of lLlness and injury. 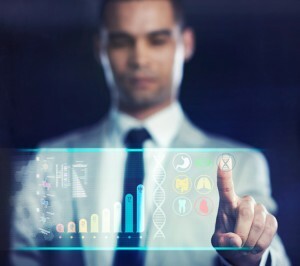 It is approved by the FDA, it is covered by insurance in many cases and it is considered mainstream medicine by medical journals, medical textbooks and major medical hospitals and universities, nationwide. Remember, HBOT does NOT replace any medical treatments, but in fact augments treatment you have already initiated. Our office is an outpatient facility providing advanced medical grade HBOT, and we encourage your patients to follow up with you regularly. Protect your practice by enhancing your healing statistics. Welcome to a more efficient way to heal. Welcome to Hyperbaric Oxygen Therapy of Marin: Advanced Hyperbaric Recovery. 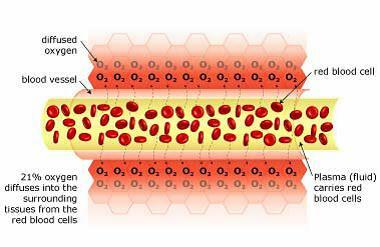 Normal blood flow There is 21% oxygen in the air that we breathe, and our lungs transfer this oxygen to our red blood cells (via hemoglobin). 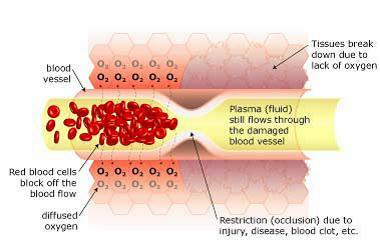 These oxygen-filled red blood cells are carried around the body by the plasma (fluid), which travels through the blood vessels. The oxygen diffuses into the surrounding tissue ensuring that it is delivered to where it is needed most. Restricted blood flow (ischemia) causes Hypoxia. 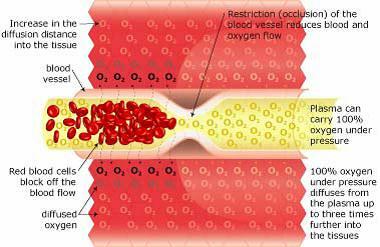 When there is a restriction (occlusion) in blood flow due to surgery, illness, or injury, the red blood cells block the blood vessel and are unable to transfer oxygen to the cells on the other side of the occlusion. This causes swelling and starves the area of oxygen, causing hypoxia (a lack of oxygen); when this occurs the tissue begins to break down. Hypoxia triggers ‘apoptosis’ (programmed cellular degeneration – clumping and clustering of damaged nerve cells surrounded by healthy neuronal tracts). Apoptosis modifies the expression of plasticity (the ability of the body to repair). Apoptotic bodies and altered DNA fragmentations are observed in the avascular ischemic region with increased inhibitory biochemical factors (proteins) released into the damaged parts of the brain and spinal cord causing further deterioration. Apoptosis has been identified in all neurodegenerative disorders including brain and spinal cord injury. Apoptosis fosters the cycle of continued dysfunction, degeneration and ultimate neuronal death. Hyperbaric Oxygenation: Breathing 100% oxygen under pressure causes the oxygen to diffuse into the blood plasma. This oxygen-rich plasma is able to travel past the restriction, diffusing up to 3 times further into the tissue. The pressurized environment helps to reduce swelling and discomfort, while providing the body with at least 10-15 times its normal supply of oxygen to help repair tissue damaged by the original occlusion or subsequent hypoxic condition. 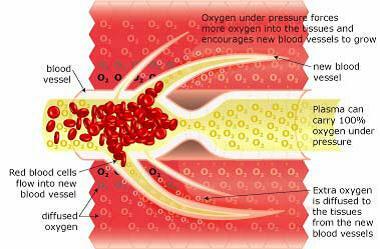 Hyperbaric Oxygenation (HBOT) directly increases the saturation of tissue oxygenation, slowing and reversing hypoxic induced apoptosis - restoring blood supply to the compromised region by the development of new capillary networks (neovascularization) enabling the body to alter the course and impact of the disease process. Neurovascular Regeneration: HBOT mobilizes the body’s circulating stem cells. American Journal Physiology - Heart and Circulatory Physiology (Nov 05)] reports a single 2-hour exposure to HBOT at 2 ATA doubles circulating CD34+ progenitor stem cells (primordial cells targeted to salvage and restore damaged structures); and at approx. 40-hours of HBOT; circulating CD34+ cells increases eight fold(800%).